From 2000 to 2012, the Archives of American Art has received substantial grants from Nanette L. Laitman of New York, through the William and Mildred Lasdon Foundation, for the creation of the Nanette L. Laitman Documentation Project for Craft and Decorative Arts in America, an important program to document the life and work of America’s leading craft artists. Over the course of the project the Archives has recorded and transcribe 235 oral history interviews with key figures in American craft. The grant also supported a major campaign to collect the papers of prominent artists working in clay, glass, fiber, metal and wood, resulting in more than 100 new acquisitions. Oral history interviews of the major figures in the craft field provide a permanent record of their reminiscences of the aesthetic visions and technical innovations that have defined the craft movement in America. These firsthand accounts also shed light on the philosophical roots of craft education, the development of the American craft market, and issues of patronage and influence. The project illuminates new avenues of inquiry for researchers by placing these collections and interviews within a broader context of the history of the visual arts. 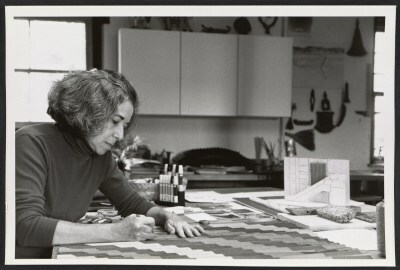 With her gift to the Archives, Nanette L. Laitman has made an unparalleled contribution to preserving the primary records of American craft and laying the groundwork for future research. Finalized; not available online. Patron must use Archives copy.